In Part 2, I wrote about my quest for a decent-sounding audio system that was simple to install and wouldn’t break the bank. The Samsung TW-J5500 powered tower system was my eventual choice. In this concluding article of the series, I praise my TiVo and how it is the ideal video source for my project. I’ve been a TiVo fan and user since 2006, and have progressed through three generations of TiVo hardware. The TiVo Roamio DVR we now use has just about every feature you could wish for in a DVR. With the Roamio, I can record up to six shows at the same time; I can stream video and photos from my PC; I can remotely watch my recorded TiVo programs on my tablet or smartphone. The latest software updates to TiVo provides a “quick mode” which speeds up playback of recorded shows by 30 per cent without significantly altering the audio pitch, and commercial skip, which allows us to skip entire commercial breaks on many popular shows with the press of a single button. When looking at video sources for the budget home theater, I remembered reading about TiVo Mini, and decided to give it a try. The TiVo Mini is a small streaming unit that extends the functionality of a TiVo DVR to another TV (or in my case, a projector) in your home. The TiVo Mini requires a wired network connection, either Ethernet or MoCA. MoCA stands for “Multimedia over Cable Alliance” and is an industry standard for sharing cable wiring between cable TV signals and data traffic. I do not have an Ethernet connection near the home theater, but there is an existing cable TV run to that room, which is all that the TiVo Mini needs. My TiVo DVR, a Roamio Pro model, has an internal bridging adapter that creates the MoCA network over the existing cable TV wiring. Basic installation is a snap. First, you go to the TiVo DVR and create a MoCA network. Then, you connect the TiVo Mini to the coax, and when it powers up, it discovers the MoCA network that you just created. Running initial setup on the TiVo Mini takes a few minutes, during which a software update is done if needed, and the Mini becomes an extension of the host TiVo DVR. The Mini comes with the familiar TiVo remote, and it operates just like the host unit. We can watch live TV streamed from the Roamio to the Mini, as well as shows we’ve recorded on the Roamio. 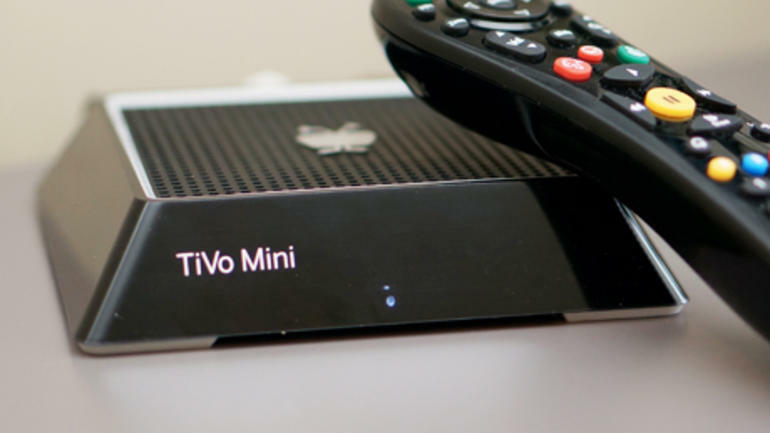 All the streaming services that TiVo supports are available on the Mini, but the service, e.g., Netflix, sees the Mini as a separate device, so you will need to login with your credentials for each streaming service that you want to use with the Mini. A highly-recommended final step is to install a point-of-entry (PoE) filter where the Cable TV line enters your home. MoCA puts Ethernet data on your Cable TV coaxial cable, and the PoE filter keeps that data from possibly being received by your neighbors. My Epson projector has two HDMI inputs. Switching between them is easy, using either the remote, or buttons on top of the projector. The TiVo Mini is our most-used theater source, supplemented up with a Blu-ray player on the other HDMI input. I also have a Roku streaming player for channels that are not available on either TiVo or the Blu-ray player. Our theater for two was completed with matching power recliner chairs and some cinema-themed wall decorations. Since installing it, we’ve enjoyed it more than any traditional theater experience, short of Imax or Omnimax. Both our Blu-ray player and Epson projector are 3-D capable, so investing in some 3-D glasses may be our next addition to the setup. In Part 1, I wrote about my plan to build a simple home theater on a budget and my process of selecting a projector and screen. This time, the topic is sound. I found out quickly that using the right terminology is very important in searching for audio equipment. In audio, the term “home theater” almost always means a receiver, a set of surround speakers with a powered subwoofer, and sometimes a Blu-ray player. This setup didn’t fit the vision I had for the room because of needing a receiver (which I had already ruled out), and the difficulty of placing and wiring speakers all around the room. For the types of movies and TV shows we watch, we don’t really need the surround sound experience, nor the thundering bass that Hollywood loves to use for explosions, earthquakes and dinosaurs! I stopped looking at home theater systems, and switched my quest to “soundbars” and similar products. A soundbar is a one-piece powered unit made to sit below a video display. It contains stereo speakers and sometimes comes with a separate subwoofer. I didn’t like the looks or the sound of most of these that I researched, but an unconventional system by Sharp caught my eye. The Sharp HTSL-75 is a soundbar with a difference. The “bar” can be split in two, and each half mounts on a sleek, modern-looking pedestal to flank the screen on both sides. The system had a list price of $350, but the retailer was offering a deep discount on an open-box item plus a no-hassle return policy, so I ordered it. The Sharp product looked, well, sharp, but the sound was a huge disappointment. The audio was thin and weak, more suitable for a dorm room than anything resembling a theater. There was also no unity in the sound. I could hear the pedestal speakers and I could hear the sub, but there was no sense that the various parts were playing on the same team. The Sharp system also lacked the power to deliver adequate volume to the room. It was a no-brainer to ship it back. A few days later, we were out, and the woman who I promised to love, honor, cherish, obey, and take her audio advice said, “Why don’t we see if Sears has anything that might work? They still have an electronics department, don’t they?” I honestly admit that I had no hope of finding anything remotely interesting at Sears, but since we were there, we walked in to take a look and listen. Long story short, we drove home with an audio system! The Samsung TW-J5500 Sound Tower system has exceeded my expectations in every area. First and foremost, the speakers sound great. The system consists of two towers, each with a high-frequency horn, midrange driver and dual ported subwoofer. Samsung calls this a 2.2 design. One of the towers contains a 350 watt amplifier, the informational display and all of the connections. Installation is extremely simple. Just plug the powered tower into an AC outlet, and connect the passive tower using the included cable. For my setup, I bought a long audio cable with a 3.5mm stereo plug on each end to go from the projector to the powered tower. The sound is smooth and powerful across the entire listening range. The amplifier power is well matched to the capabilities of the speakers themselves. There is deep bass that’s there when you need it, but isn’t overpowering. High frequencies from the top-mounted horns are also crisp and well-defined. Dialogue, music and special effects in the movies we’ve watched are all well balanced. The speaker towers have a modern, high-tech look, with exposed speaker cones for the midrange and subwoofer drivers. There is enough power from the amplifier to deliver theater-like volume levels, but you won’t be shaking the house with these. The system has traditional phono plugs for audio input, plus an optical input and a 3.5mm stereo jack. There are two USB jacks for playing your favorite music from a memory stick, and as a bonus Samsung has included Bluetooth audio connectivity. Though I’ve never tried it, the documentation says there is an FM Stereo radio in there, too! List price according to Samsung is $450, but at the time this is written, Amazon is offering the set for just over $300. Overall, I couldn’t be happier with the sound quality and versatility of this audio system, and it looks great in our theater room. If I had to find anything to gripe about, I found it odd that the tower with the inputs, amplifier and electronics is hard-wired to be the right channel speaker, and that can’t be changed. Next post, the wonder that is TiVo Mini. When we set out creating our home theater for two, we knew we wanted a cinematic experience without spending a Hollywood blockbuster budget. Purists would say that we’re not building a “real” home theater, but my goal was to keep the number of components, and thus the cost and complexity, to a minimum, while still delivering a satisfying movie experience. This meant no high-powered 5.1 surround-sound audio, and hopefully no need for an audio/video receiver. Ultimately, my checklist consisted of an audio-video source, a projector, and an audio system. Getting by without an A/V receiver presented some challenges. Traditionally, the HDMI source is connected to a receiver. The receiver then powers the speakers and passes the HD video to the flat screen, projector or other video display. Without a receiver, the speakers would have to be self-powered. And without a receiver, there would need to be an audio path from the source device to the speaker system. We had an available wall for a projection surface which had been freshly painted. Special screen paint can run from seventy to nearly three hundred dollars per gallon, so I decided to hold off on that expense until I could evaluate just using the plain wall as a screen. While I am sure that screen paint would provide additional brightness, we find the wall to be quite acceptable. To check the “whiteness” of the wall for brightness and accurate color rendition, I followed the advice I had heard from another home theater builder… I taped a sheet of bright white printer paper to the wall, then projected various scenes onto it. Amazingly, the paper completely disappeared at a normal viewing distance! We may invest in a screen or screen paint later, but for now, our wall provides a very good high-definition viewing experience. A couple of weeks ago, I flew out of Columbus, Ohio on American Airlines. I was connecting in JFK, and since I had a tight connection time (gotta have words with my travel agent on that) I was getting concerned because the incoming aircraft had not yet arrived, and boarding time was approaching. I walked up to the gate agent to see if he had information on how late we were going to be. The agent, Scott, from his name tag, gave me the information I needed. First, that the incoming aircraft was approaching the airport and would be landing shortly. Secondly, he assured me that he would personally do everything he could to assure a quick turnaround of the plane. On a side note, he said we were getting a fresh flight crew and all of its members were present and checked in. And finally, he said that he would monitor the situation for me and if necessary, see what could be done if my connection seemed in jeopardy. Then, he said he was happy that I was on his flight, and said he was very good at getting it turned around quickly and efficiently. On the surface, this is a level of service and concern for a paying passenger that should be baseline from any customer service employee. We all know, though, that such is seldom the case. The incoming flight arrived and Scott, true to his word, made sure that boarding was fast and efficient. I think we finally departed less than 15 minutes behind the scheduled time. 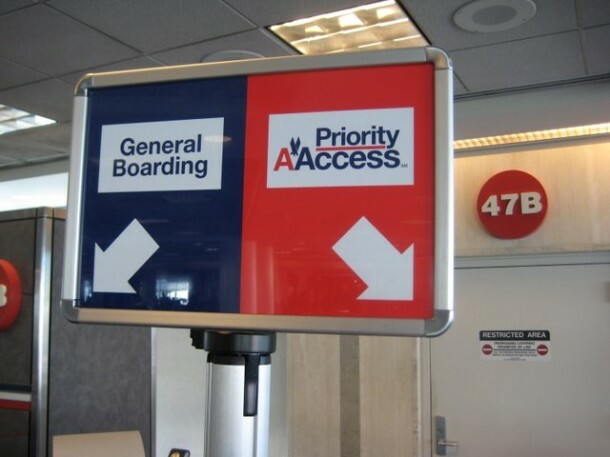 In JFK, the connection was not a problem, though a walk from one Jetway directly onto the next is never what I would call a “comfortable” connection. Nonetheless, I kept thinking about Scott, and his attitude toward me and toward his job. He took ownership of my concern, affirmed a commitment to help the situation and shared his pleasure that I was flying AA and letting him work for me during this small phase of my journey. It was just a few sentences exchanged, on a “problem” that never really materialized. But Scott was in charge of that gate with an attitude as if he were the CEO of the airline. I wonder how many counterfeit twenty-dollar bills are really caught by those “detector” marker pens that seem to be at most retail check-outs these days? Not many, I’ll bet. We were in Target the other night and I paid with a twenty. The clerk took my money, put it in the drawer, swiped The Pen on it, and proceeded to make my change. To my observation, the drawer was closed far too quickly for the cashier to have really taken a look at the mark on the bill. If my bill had been counterfeit, the most likely scenario is that the bill would have been accepted unchallenged by the cashier, and then given out in change to the next customer who paid with a larger bill and needed a twenty in change. These pens, as used, fall squarely into the category of False Security. The retailer thinks they are being protected against counterfeit bills, but the way the pens are used doesn’t really provide the desired protection. I wonder what happens in the case where Alice hands the cashier a fake bill, The Pen is used and the (undetected) fake bill goes into the till. Bob is the next customer in line and is given the bill in change. Is the store guilty of passing counterfeit money? I am not a lawyer, but it seems to me pretty obvious that the store would be found guilty. Does the store assume greater responsibility (and thus liability) by using the pen? Would the store be better protected by not using the pens at all if they are not actually stopping cashiers from accepting bad bills?